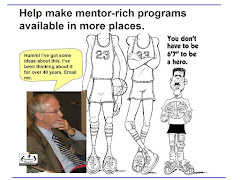 National Mentoring Month - Who Mentored You? through the 4th Annual National Mentoring Month campaign. During the month many celebrities will talk of how important a mentor has been in their lives. A few months ago I heard a former US Attorney for Northern Illinois, Anton Valukas, talk about how his years as a mentor to 3 inner city boys was more important than the years he was the powerful US Attorney. I've been a leader of a tutor/mentor program for more than 30 years, and I agree with how important mentoring is, to the youth we've connected with adults, and to the youth connected to mentors. I also know, that mentoring alone, is not enough to help kids living in high poverty, inner-city neighborhoods stay in school and move to jobs and careers. 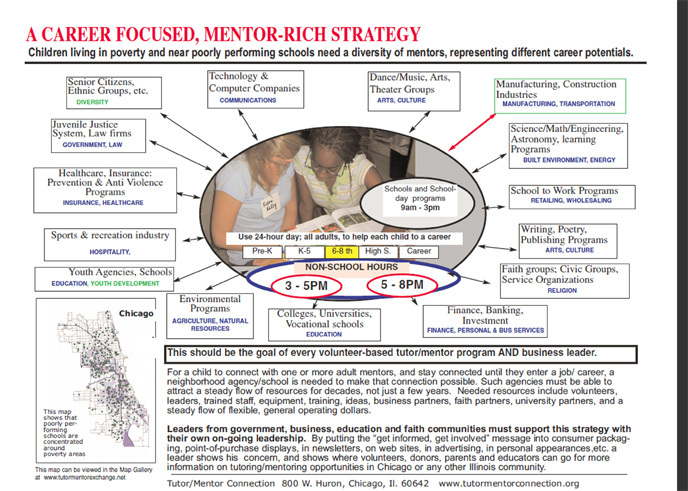 That's why I coined a term "Total Quality Mentoring, TQM", which describes the type of mentor-rich program we lead at Cabrini Connections in Chicago. In a TQM program we surround youth with many adults, not just the primary one-on-one mentor, and we provide a range of learning, enrichment and skill building activities. This is a village of adults, all focused on helping raise the kids to reach jobs and careers by their mid 20s. Good mentoring, regardless of the format, depends on an effective system of coaching and support for mentors. In a TQM program, that system of support requires funds to rent space, provide computers, and offer learning activities in addition to mentoring. mentored you and look for ways to make a financial donation to support Cabrini Connections and the Tutor/Mentor Connection, or one of the other volunteer-based tutor/mentor programs operating in Chicago or in other cities. My hope is that some of the lawyers and stock brokers who are making multi-million dollar bonuses this year will think of how a mentor has helped them have their success, and they will make major gifts to tutor/mentor programs, rather than the IRS, as a way of celebrating their success. With such help some of our teens can be successful business leaders in the future. Can you help make that happen? Thanks to everyone who has helped us connect inner-city Chicago youth with volunteer tutors and/or mentors during the past year. Your donations will help us do that again in 2007. The Chicago sports writers and editorial writers are using a lot of ink this week, talking about the troubles of Tank Johnson, a Chicago Bears football player. 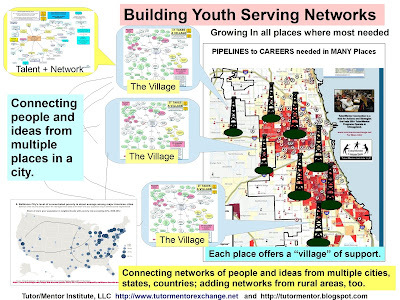 However, as the graphic illustrates, talking about Tank's problems, ignores the larger problem of millions of youth growing up in segregated, high poverty inner city neighborhoods, where the most common role model for many kids is a gang banger, an ex-convict, or some other form of thug. While writers are talking about whether the Bears should or should not kick Tank off the team, I'd like to see a few writers talk about the way tutors/mentors can help youth choose more positive paths. I'd like to see writers turn Tank's problem into an opportunity to help thousands of teens grow up with a broader network of mentors and role models. All you need to do is reach out to readers and ask them to join the Cabrini Connections, and Tutor/Mentor Connection's team. If you make a holiday donation to fund Cabrini Connections and the Tutor/Mentor Connection you can help inner city teens link with volunteers who model positive lifestyles, who help kids with academics, and who help kids learn to make positive choices that give them better opportunities in life. If you'd like to support a different program than Cabrini Connections, use the Chicago Programs Link to shop for choices of who you want to help. 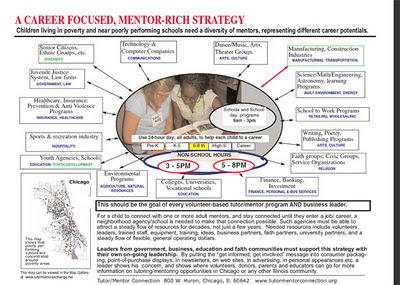 This is one of many ways the Tutor/Mentor Connection tries to link volunteers and donors with tutor/mentor programs in all parts of Chicago. Tank's story is part of a bigger story. Please don't ignore it. It's a potential iceberg that can destroy many lives, and many futures. Here's how to use this blog. Each article includes graphics. Click on them to get enlarged versions. Each article has many links (which are often broken on older articles). Open the links to dig deeper in the ideas and strategies I share. On the left side are tags which you can click to find articles that focus on the same topic. Below that are links to other web sites with relevant information. Learn more about me at http://www.tutormentorexchange.net/dan-bassill. Fund Raising articles. Follow the links. I combine 40 years of unique experiences into my leadership of Cabrini Connections and the Tutor/Mentor Connection. Few people in the US have a similar depth of involvement and experiences. You meet me in LinkedIn, Facebook or other links shown below.